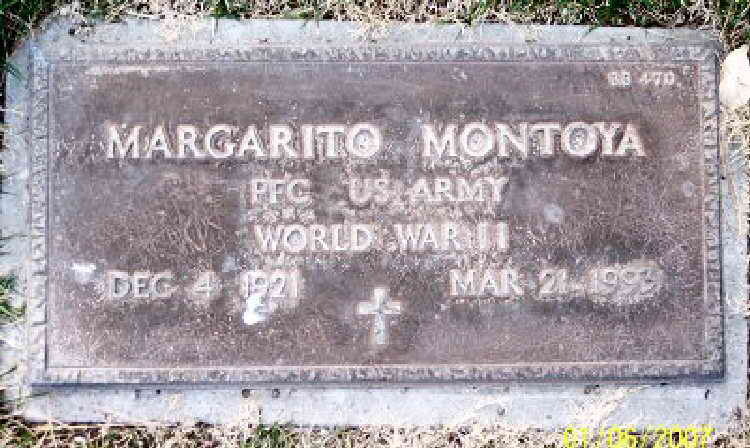 Grave marker for Margarito Montoya in Section BB, Grave 470 of the Southern Nevada Veterans Memorial Cemetery, Boulder City (Clark County), Nevada. Pvt Montoya, a member of Company A, was serious wounded on 23 June 1944 in Normandy and received the Purple Heart. He was hospitalized and rejoined the Company more than a month later on 26 July 1944.